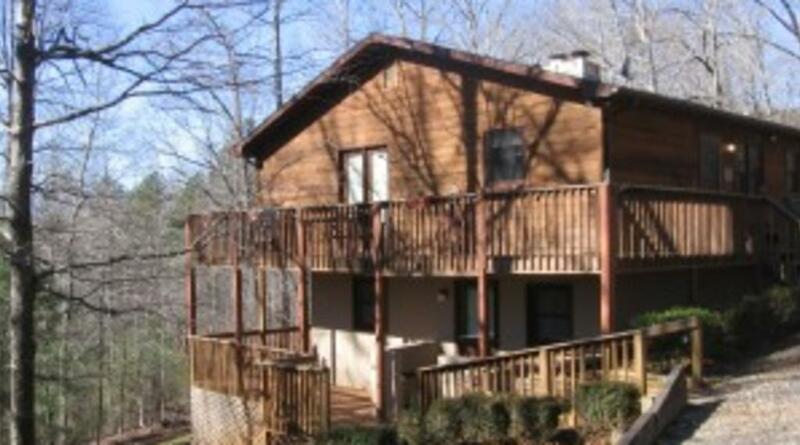 Hurricane Haven is a wonderful home situated on a beautifully wooded lot in a private section of Riverbend in Lake Lure. The quintessential vacation destination, Hurricane Haven has all the charm and comfort you’ve dreamed about. Enter into the fully equipped kitchen, which is large enough for any gathering. Read a book in front of the wood burning fireplace adjacent to the dining room in the large rocking chairs. The couch pulls out to a single bed for extra sleeping. Who doesn’t like falling asleep to a crackling fire? The open floor plan allows friends and family to gather, talk, watch the game, or play a game at the table. The living room has a huge 50” TV for everyone’s viewing pleasure, whether it is DVD’s, sports, or old classic movies. Maybe even fall asleep on the pull-out sofa. French doors allow access to the deck and gas grill. The dining area boasts a large table with extra leafs for special meals. Also off the dining area is door leading to a deck with Adirondack chairs for relaxing while overlooking the back yard. 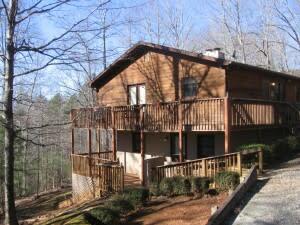 Also on the main floor is master bedroom with king bed, TV, and French doors to deck. A full bath is just off the hall. The lower level consists of an area with TV, rocking chairs, an area for the kids to play, and a table for cards or board games. A wood burning potbellied stove adds to the comfort. A double sofa bed pulls out of the cabinet and half bath is just off this area. French doors also lead out to lower deck. At each side of this room are 2 bedrooms. Both have queen beds, TV’s and French doors leading to deck area. There is also a full bath and separate laundry area that round out this level. The large deck area offers chairs to relax, a water feature, and outdoor dining on the deck protruding over the beautiful wooded lot. Hurricane Haven is a wonderful home at which to spend a few days or a full month while you enjoy the time away from your cares. Enjoy a cup of coffee in the warmth of the morning sun. Or, watch the wildlife as it wanders by. Enjoy the evening stars; even make a wish the time here goes by ever so slowly.